Much mainstream media coverage of the helicopter attack on Venezuelan government buildings has focused on Oscar Alberto Perez’s bombastic statements about “restoring constitutional order.” But listen closely to the other expressions and terms Perez uses in his video statement. They provide a window into a fascistic form of thought that may come to define the opposition in Venezuela. Oscar Alberto Perez in a still from the video statement released during the June 27 helicopter attack. It was almost inevitable that the Venezuelan crisis would generate fascist specters. With 80 dead amid continuing street clashes, and the nation caught between an uncertain bureaucracy and old guard opposition, the terrain is beginning to open for other, radical actors to step in. On June 27 the already volatile situation took a new turn when a hijacked police helicopter was used to attack several government buildings. The Ministry of the Interior and Justice and the Supreme Court were targets of an assault that included grenades but no injuries. What should garner more attention is the video released during the assault by Oscar Alberto Perez, an officer in Venezuela’s Penal, Criminal and Scientific Investigation Police Agency. Perez not only took part in the attack, but claims to be part of an underground network nestled within the security and armed forces determined to end the embattled government of Nicolas Maduro. It was an act that could almost be called cinematic in its planning. Perez’s video is quite the Gothic statement; complete with heavy shadows and military hardware. He looks sternly at the lens with a Mussolini frown, adorned in a combat uniform. Behind Perez stand masked, goggled men holding machine guns. It is the work of someone who knows how to project a specific image. 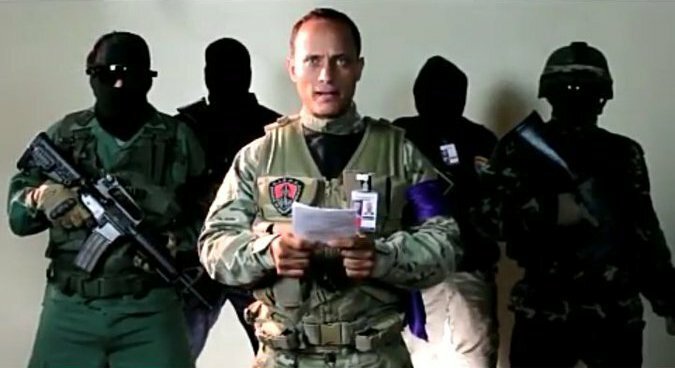 Before becoming a coup plotter, Perez also worked as a B-movie actor in Venezuela, starring in typically macho roles in films with titles such as Suspended Death. In stills from the movie one can see the cold eyes which now proclaim to Venezuelans that deliverance is at hand from decaying, internationalist socialism. It is no surprise that some in the Venezuelan opposition are now decrying this whole episode as a false flag generated by the Maduro government to justify heavy handed measures against continuing unrest. Until now much of the opposition’s leadership has been defined by figures of the old social guard, dressed in polo shirts, baseball caps, and behaving like typical products of the Latin American private school system. The main opposition leader, Henrique Capriles Radonski, has always given the impression of being somewhat level-headed, and fit to walk the streets of Westwood or Beverly Hills as a lawyer or trust fund bachelor. These figures have succeeded in setting the streets of Venezuela aflame due to a disastrous economic crisis and a bungling government. Yet they have lacked the visual power and dramatic flair necessary to lead a revolution. This is one reason — in addition to their identification with the upper classes — why they could never compete with the eloquent, larger-than-life image of the late Hugo Chavez. When oil prices were riding high, and Chavez seemed capable of bypassing the capitalist structures of the country in order to fund his project, someone like Radonski could never compare with the red-clad titan. Now, with Chavez dead, replaced by a less charismatic Maduro, there appears the first sign of revolutionary fascism rearing its head, using image and violence to gain converts. Being an actor, Perez knew how to plan the helicopter attack to be more theatrical than deadly. A banner hung from a side of the chopper reading “Liberty. Article 350.” This was a dramatic gesture using the section of the Venezuelan constitution giving citizens the right to rebel against a tyrannical regime. Ironically, this was the constitution founded by Chavez himself after first assuming power in the late 1990s. But in the heat of drama what counts is the impact of the image. Up to now the Venezuelan opposition has lacked any sense of political romanticism. Perez has grasped the need for heroic gestures, but with the dark arts of fascism. The situation in Venezuela is a strange mixture of escalation and stalemate. The opposition has rallied enough support to pose at least an electoral threat against the Maduro government, but they still have not been able to fully penetrate the poor and working class sectors — those still clinging to what’s left of Chavismo’s social programs. If a radical nationalist movement emerges that can make inroads among the downtrodden, then the balance of forces could change for the worse. Already there are signs that longstanding but dormant fascist movements are using the current crisis to reemerge. Prominent among these movements is ORDEN: Movimiento Nacionalista (ORDER: Nationalist Movement), which boasts a flashy website, slick propaganda videos, and a newspaper. The group’s logo turns the national flag’s white horse into an equestrian lightning bolt. Like Golden Dawn in Greece, ORDEN cloaks itself in the language of national salvation while sporting classically fascist iconography. It is easy to find ORDEN banners within some of the current opposition marches. They are by no means representative of the dominant trends within the opposition, but if the situation escalates to new levels of violence they could have a window of opportunity. The opposition has been carrying out acts of sabotage and violence aimed at specific, social symbols of the government that frame the conflict as ideological. The news site Venezuela Analysis reports that anti-government groups set fire to 50 tons of food at a government distribution center in the state of Anzoategui. Graffiti was left on the center’s walls exclaiming “Damn Chavistas.” This comes in addition to recent assassinations of Chavista activists, lynchings and burnings of perceived Chavistas in the streets, and the assassination of judge Nelson Antonio Moncada Gomez, who was involved in the sentencing of jailed opposition figure Leopoldo Lopez. Lopez stood accused of helping spearhead a wave of violence during protests in 2014. Even if opposition figures such as Radonski, Machado, or Lopez do not openly condone these incendiary actions, the taste for blood will grow as neither side budges. This is a toxic terrain, ripe for the breeding of fascist forces. On the Bolivarian side of the equation the situation is becoming uncertain and fractured. While Maduro continues with plans for a constituent assembly, he has now warned that an overthrow of the system will be met with armed struggle. Dissent within the Bolivarian ranks is now apparent with the outright revolt by Attorney General Luisa Ortega, who has now been hit with a travel ban and asset freeze by the Supreme Court. This is a surreal situation which suggests a government immersed in its own, backdoor power struggles. The defining player will be the armed forces. If a figure in the style of Perez emerges from the top echelons, then tanks will settle the matter as in Chile in 1973 or Egypt in 2013. It is telling that Perez has not been captured by security forces, despite the government’s active hunt. The question must be raised if he does indeed have allies within the armed forces or other government sectors sheltering him. It is uncertain if a constituent assembly will settle anything in Venezuela, as Maduro increasingly seeks to make concessions to the business class while making populist announcements about street consultations and endlessly raising the minimum wage. The Bolivarian experiment never had a clear, defined theory or framework — Chavez seemed to be improvising and revising from 1998 until his death in 2013. In breaking out of the Marxist patterns of the previous century, Chavez seemed to be attempting a gradual transformation through stages which were at times inspired and other times unclear. Where Venezuela was headed is an answer tragically cut off by the illness that ended Chavez’s life. Now Maduro finds himself in a strange social democratic limbo, with Perez signaling the emergence of very clear, defined fascist elements desperate to burn down the Bolivarian project. The Venezuelan currency has lost 99.8 percent of its value in the last five years, and the country is now struggling forward with no more than $10 billion left in its treasure chest. This is not a failure of socialism, as the capitalist class is quick to claim, but the result of an improvised attempt at 21st-century radical reform dependent on one commodity — oil — which never transformed the social fabric of the country. The danger is that fascism, being reared in the ruling classes and dominant global economic system, is always clear about what it wants and how. Perez in his video explicitly proclaims nationalism and religion as guiding creeds. As Enzo Traverso makes clear in Fire and Blood: The European Civil War 1914-1945, his key study of Europe’s wars and their ideological roots, Francoism in Spain clearly defined the opposing sides as “the fatherland and anti-fatherland.” This is how Perez and other groups such as ORDEN define the struggle inside Venezuela, as nationalists against those infected by the foreign (particularly Cuban) idea of socialism and internationalism, and the opposition always makes a point of condemning Venezuela’s generous oil deals with allied countries. If Venezuela is not engaged in open civil war, it is most certainly in the midst of fierce social war defined by clear ideological antagonisms. Venezuela’s terrible drama should be watched closely by leftist movements in the Americas and beyond. Still wandering in a post-Cold War haze, movements such as Die Linke in Germany, Podemos in Spain, and Syriza in Greece find themselves trying to maneuver in restless social waters as new reactionary forces, based on blood and land cults, organize. While the left seeks to rediscover what programs to offer in the age of austerity and Trump, the side of violent reaction offers clear, chauvinistic options. They will use aesthetics and bold actions, leaving their opponents looking like stale bureaucrats. In this sense, the danger lies not so much in fascism becoming a dominant ideological force in Venezuela, but in how it can take advantage of a fractured situation. The revolution’s cadres are willed to fight for a project that itself remains uncertain and undefined. Fascism could then come in through the back door, cloaked in the assurances of flag waving and tradition. Time will tell if a population tired out by violence and uncertainty will push back or instead wait and see how the situation sorts itself out. Perez might only garner 15 minutes of fame, but they are 15 minutes that warn of a developing storm. Alci Rengifo is a writer and critic based in Los Angeles who regularly contributes to the Los Angeles Review of Books and is an Associate Editor at the East Los Angeles monthly Brooklyn & Boyle.